A couple of shots from my walk to the dermatologist last week (or was it the week before?). 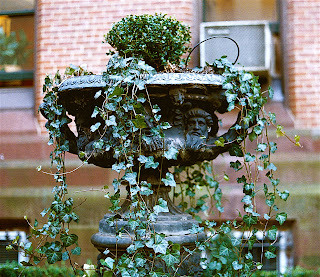 I took another one of this er, fountain? floral receptacle? sculpture thingamahoochie? from an angle that didn't include the AC unit but it didn't do what I needed it to do for the faces so please photoshop out the AC with your mind. The little details. I really like these pictures. Mrs. Chili is way smarter than me. I like the pictures, too, but I can't say anything as cool as THAT. Chili, I'm glad that you like your Birthmas picture. I'm so flattered that it has a place of honor. 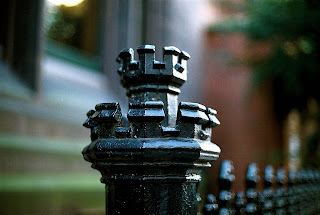 I love architectural details. There's a lot of new construction in my area and none of it has all the pretties that the pre-war buildings have.